First of all, there are three different types of wedge style monitors. These are the same three types of speakers that you can have for your main speakers as well. I'm not going to go into great detail, because you can read my article on types of speakers to find out more about these. Wedge monitors are very simple, but there are two main components to it: power source, and signal type. 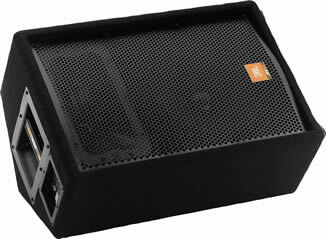 The power source can either be straight from the soundboard (assuming your sound board has a built in power supply), a power amplifiers, or your monitors can be self powered, with a 120v power cord attached directly to the speaker. The signal comes straight from the sound board and can either be a ¼ inch cable, XLR cable, or a speak-on cable. There are many different variations on these different types of systems, but this article is going to focus more on the advantages and disadvantages of wedge style monitor systems compared to its rival, the wireless in ear monitor systems. Wedge monitors are much cheaper than their rival, in ear monitors. They are a lot more cost effective for two reasons, 1) their price tag itself is actually cheaper, and 2) when you have a lot of people on stage, people can share monitors. Unlike sound isolating headphones, wedge style monitors allow you to interact with your audience more. Wedge monitors allow you to hear the audiences’ reactions more, and this allows you to build a better relationship with them, and ultimately give a better show. In a church worship setting, it is important that the band can clearly hear everyone in the congregation; for this, wedges are preferred by most worship leaders. This is fairly self explanatory. Often times floor monitors not only take up a lot of stage room, but they are also too big and heavy to transport easily. If you are going from venue to venue, it’s almost mandatory that you go out and buy or rent a trailer. When you have more speakers on stage, you will get more stage noise. It is only natural that more stage noise will produce a higher chance of feedback. The louder that your stage is overall, the more random noises that your microphones are going to amplify. This creates all types of minor audio problems, and will pretty drive you crazy trying to get rid of all the noises that are getting amplified. If this maybe the case, and those noises are being producing through the mains. I suggest using gates on the mics, to help control that noise from being heard through the house. Wedge monitors are great when you need a fast and simple setup, they are better in low noise situations, and once you get a full band onstage; I would recommend switching to in ear monitors if you have the budget. If that isn’t possible, just make sure to keep your monitor levels as low as possible and still satisfying the worship team on stage.